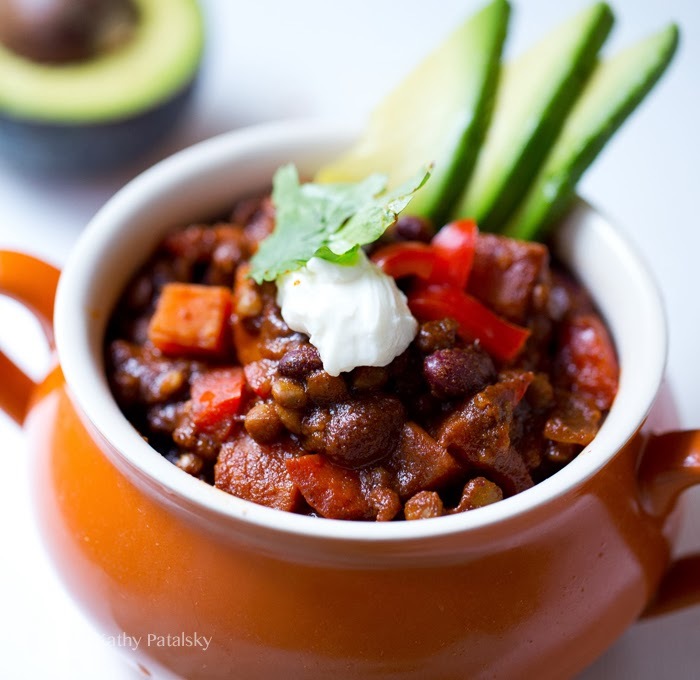 One-Bowl Wonder, Comfort Meal: Speedy Sweet Potato Chili. 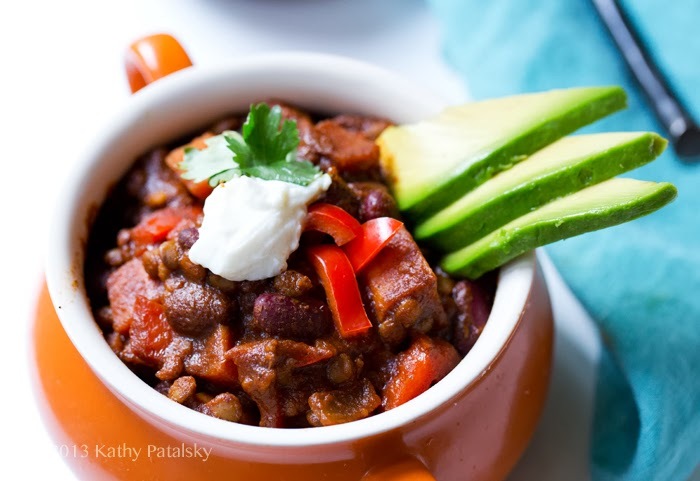 This meatless chili is warming and cozy with a spicy kick! 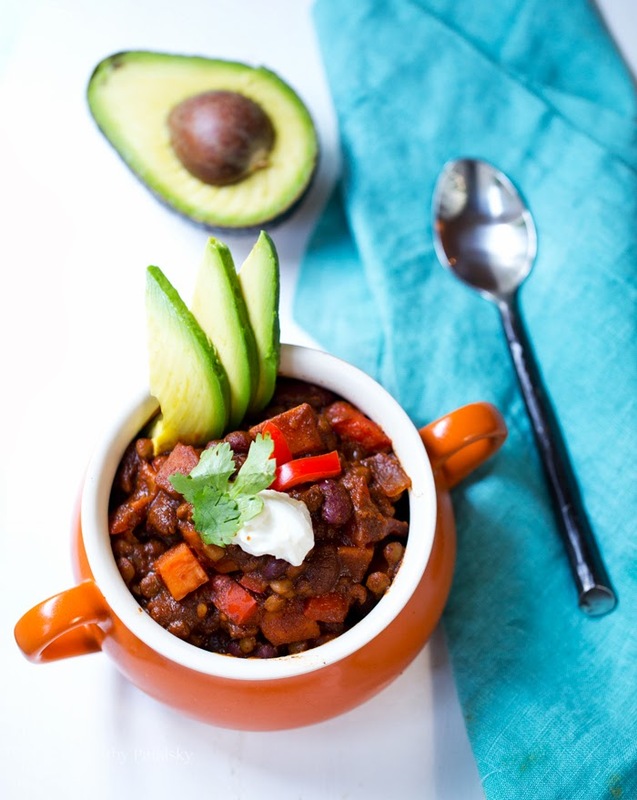 It is rich in healthy ingredients like lentils, kidney beans, diced sweet potato, tomato, onion and my secret ingredient that you have to try: chocolate! 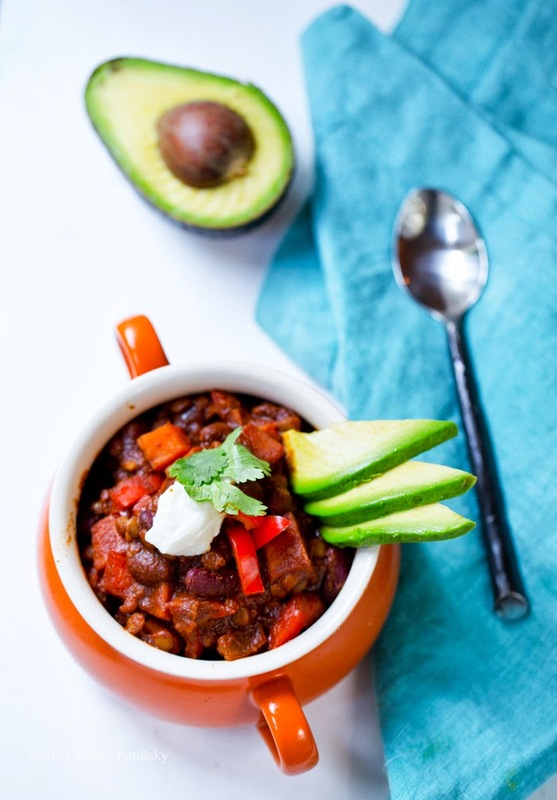 This speedy chili is perfect for whipping up for dinner on a busy weeknight. 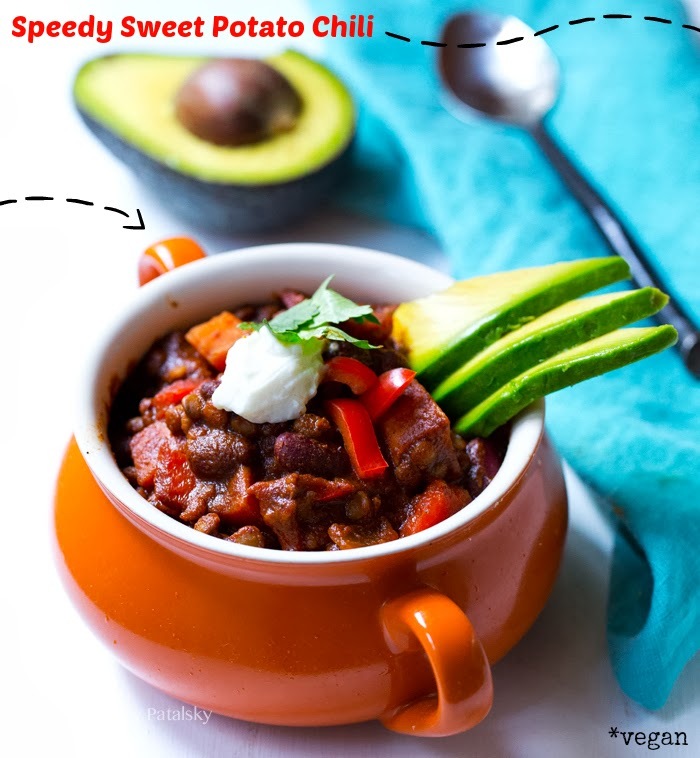 Just throw everything in a large pot and let the ingredients simmer while you run around the house or chill on the couch. 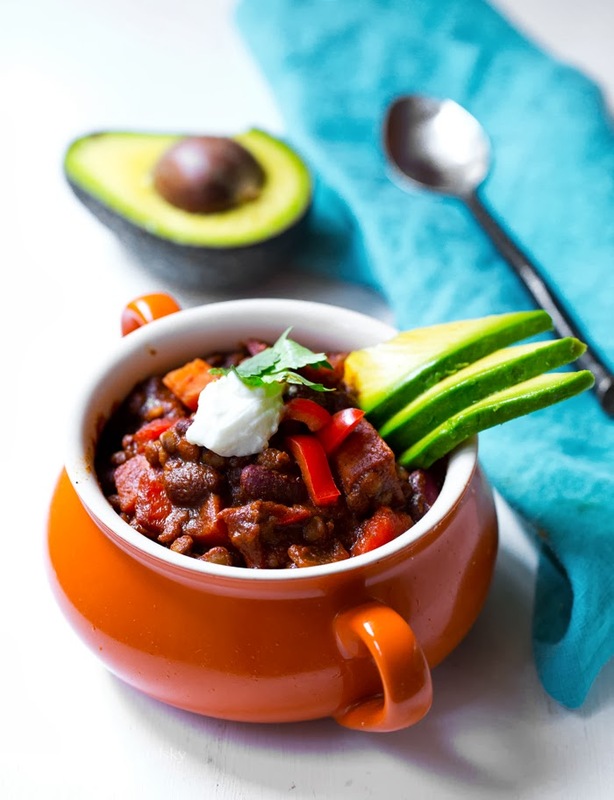 In under 30 minutes, you will be all ready to serve up homemade, comfort food, one-pot-wonder, slow-cooked-tasting chili that will help you melt away any stresses from the day. 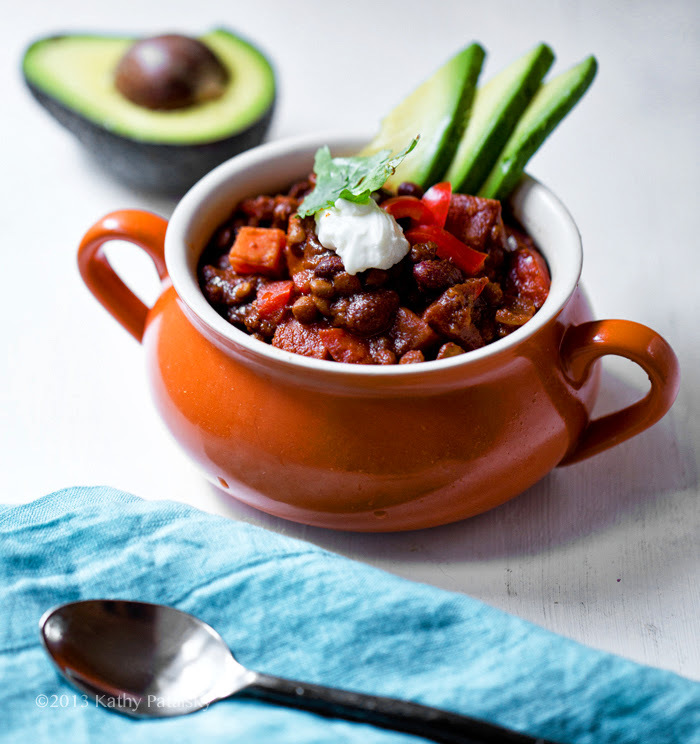 So hop in the kitchen and make yourself some of my Speedy Sweet Potato Chili!.. 1. Prep your ingredients: peel and dice your sweet potato. Dice your onion and pepper. Rinse your lentils and beans. 2. In a large pot, over high heat, add the olive oil. When hot, add in onion and peppers. Saute for a few minutes until onions become translucent. 3. Add in the sweet potato, bay leaf and veggie broth. Cover with lid and bring to a boil. 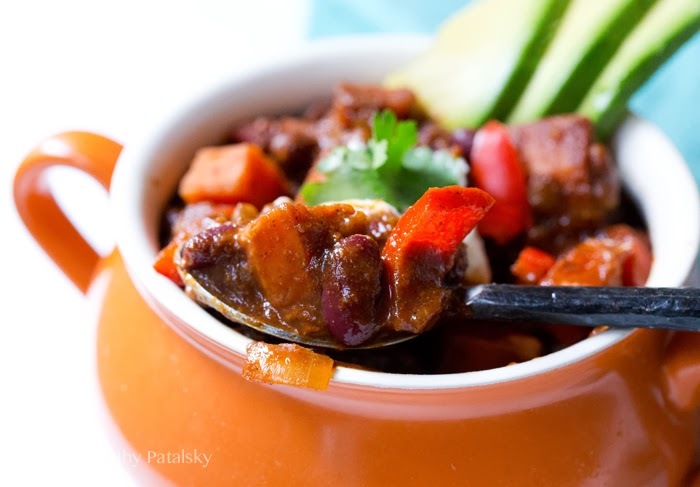 Reduce heat to medium and simmer until broth is absorbed and sweet potatoes are tender. 4. 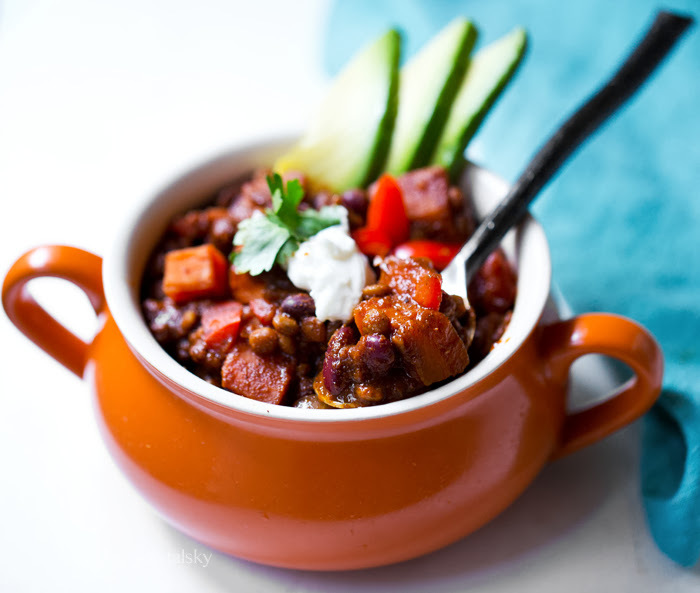 Once sweet potatoes are cooked, add in the lentils, beans, chili powder, chocolate chips, tomato paste and optional corn. Simmer over medium until the flavors all melt together and the chili thickens. Reduce to lowest heat setting and allow to simmer until ready to serve. If your chili is quite thick, cover with lid to keep in moisture. If it still seems a bit thin and watery, simmer uncovered to thicken. 5. Taste test and add salt and pepper to taste. 6. Serve warm with avocado and other optional garnish like cilantro, vegenaise, crushed peanuts and more. I like my chili served with some vegenaise-slathered grain toast.